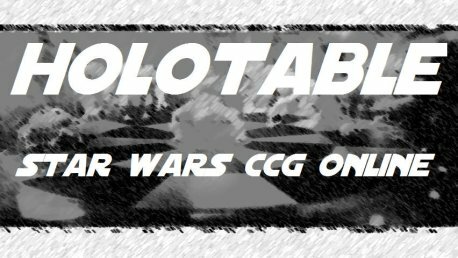 The Holotable - SWCCG online! Holotable is free to use. If you appreciate the ability to play online, you can donate through PayPal using mattmoseley@bellsouth.net. Don't feel like you have to, though. Welcome to The Holotable, where you can find everything you need to play Star Wars CCG online! Holotable and Holodeck provide the gameplay and deck building components, respectively, you need. If you've been playing all along the lifespan of SWCCG, or if you're just getting (back) into the game, Holotable provides you the ability to play the game even when you don't have anyone around your area who plays anymore. Check out the links on the left to find out more, then go to the download page to find instructions on how to get started. The PC released two demo decks for new/returning players. There are four new cards included. Holotable has been updated with the new card text and images. The demo decks are available on the downloads page as well as here. Right click the links and choose "Save link as..." or something similar. The downloads section has been updated with installers for Holotable 0.9.9/Holodeck 0.4.0. The large image installers have been updated as well. These latest versions handle the virtual card reset. They have been available for a while through the automatic update system, but I had not updated the downloads available here from the website. Holotable 0.9.8 is available through the update system. It fixes a couple of bugs related to card order in piles (both pretty rare occurences) and resets local pile positions to the default whenever you end a game. Holotable 0.9.7 is available through the update system. It adds the ability to track player ratings for games that users choose to play as counting for those ratings. Holotable 0.9.6 is available through the update system. It tries to fix a lockup problem when an observation request comes in. It also has a new feature to allow swapping one or more cards from hand with one from the Lost Pile. A fix was put in to correct card orientations for observers on initial load. Holotable 0.9.5 is available through the update system. It has a couple of new options used when responding to game observation requests. Also, there are a few bug fixes regarding pile positioning, particularly for resetting your pile positions to your configuration after finishing observing someone else's game. Finally, a new release! Holotable 0.9.4 is now available, and it has the single most-requested feature to date -- the ability to observe in-progress games on the central server! Players have the option to accept or reject observation requests, and they may kick out any observer at any time. Observers may enter and leave the observed game whenever they like; in the game they can chat with everyone but may not manipulate cards or see either player's hand. Users in a player's "Ignore list" on the server will have observation requests automatically rejected, with no notification/interruption to the player. Other changes include a fix to a long-standing problem with loading and clearing decks. Both players will now see chat messages that are loaded with saved games, instead of just the player who loaded the saved game file. A player who ends a game with the "End game" menu item now has the chance to save the game if any cards were loaded at the time. Previously the save game dialog appeared, but the cards were cleared before a save could be done. All rights to intellectual property, images, etc. remain with their respective owners.